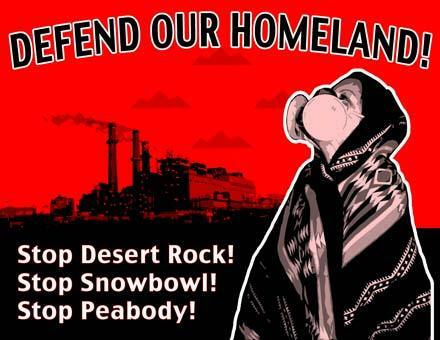 Indigenous resistance against the proposed Desert Rock coal-fired power plant continues despite intimidation and harassment. On the Navajo Reservation of New Mexico, indigenous elders and youth have been battling energy giants—and their plan to construct a new coal-fired power plant on Navajo lands—in an attempt to protect their lands and traditions. In December of 2006, resisters erected a barricade and engaged in a tense standoff with law enforcement. Though the barricade has since been removed, indigenous resisters remain on site to vigil and protest against the destruction of their sacred lands, while others seek to educate, organize, and rally their people, as well as the public at large. Two heavily reinforced police barricades, each with an estimated two hundred and fifty riot police, guarded strategic transport points near the Port of Tacoma. It was 3:30 AM on Saturday morning, in the middle of a long night of protests against the shipment of large armored military convoys through the town and port. Breath clinging to the cold night air of the Pacific Northwest, activists moved from one police barricade to the other, intending to undertake a non-violent act of civil disobedience by sitting down in the road and allowing themselves to be arrested. The police, apparently, had other plans. “If you try to bulldoze our homes, we’re going to fight. On Thursday, protesters and police were battling in the streets outside City Hall in New Orleans after more than 100 activists stormed through the gate. Meanwhile, inside the council chambers, City Council members were voting on whether or not to resume planned demolitions of low-income housing units, despite local and national resistance. Residents say the brick buildings are perfectly habitable, and accuse the city, the Housing Authority of New Orleans (HANO), and Housing and Urban Development (HUD) of a program of class warfare and racially motivated gentrification. Answered: What do you think about fear? Answered: Do Oppression and Exploitation Require the Consent of the Victim? do inside info and need-to-know practices have value to anarchists? do these methods work?